On the occasion of Porsche Cars North America’s opening of its new facility at One Porsche Drive, Porsche AG CEO Matthias Müller was present. As others did, he recognized the 60th anniversary of PCA and its current strength as the world’s largest single-marque car club. 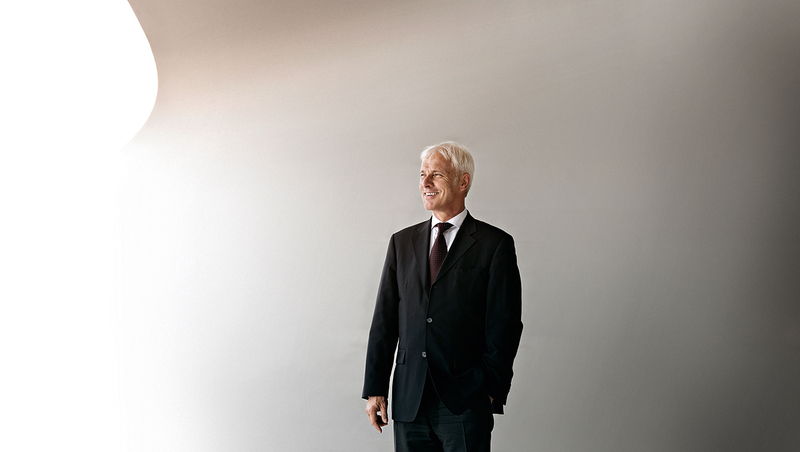 PCA’s Pete Stout sat down with Müller to discuss the current state of Porsche, and its future. Stout (S): Good morning, and first of all, congratulations on One Porsche Drive. S: It’s only been three years since the groundbreaking, which to me is remarkable. This represents, as you spoke about in the press conference, a significant commitment to the North American market. How long before the groundbreaking did this project begin? The first talks, ideas. How far back does this go? M: If I’m right, it was, I was involved in the discussion, maybe... Maybe 2011, 2012. But that was a discussion. I think we did some pre-discussions already to decide whether it will be feasible or not. S: Was there a tipping point for you, a moment for you where it became a “yes, we must do this”—and what was it? M: From the beginning we have been all together. We at Porsche have been firmly convinced that that could be the right step into the future. And what we have done after that, we have looked for ground, and for a business case. Because 100-million dollars is not small money, so we have to take care that the investment is worthwhile. We did set feasibility, and after a short time, we have took that decision. S: Is this Porsche AG’s largest investment outside of Germany? M: This is the biggest investment outside of Germany, yes. S: The board of Porsche AG is meeting here for the first time. Can you speak to the significance of that? M: We are German, and the United States is a very important market for us. Also China, for example, and we’ve also been in China some weeks ago for a board meeting. I suppose it’s good for the company and also for the employees, and the customers, to have at least one board meeting a year in our areas and regions. S: So the board has met in China before this? S: Was that a first? M: I suppose we have been in China one year ago, and we have also been here (in the U.S.) one year ago. We will do it every year. S: Reception to the Macan in the U.S. has been extremely strong, and this has been an ongoing discussion in the press with regards to supply at dealers and so-forth. What are you doing to meet that demand right now? What changes are being made in production and otherwise? M: The demand is one side of the coin. Production facilities and the capacities we have, we have to be careful with that due to the life cycles of cars. And so sometimes there is more demand than capacity, and we have to deal with that. S: What are your thoughts on U.S. market interests when it comes to the sports-car side of Porsche? The 911, Cayman, Boxster—especially with regards to the strong reception of the GT4. The latter seems to have caught Porsche off guard—how strong the reception to the GT4 has been. M: First of all, we are very lucky in the decision of the GT4 because these decisions are mostly difficult, because the feasibility is not so easy. So now we see at the beginning that it’s a huge success, and we have to take care for that—whether it is ongoing success, or whether it will reduce in demand. So we have to get experiences with all these cars. Nevertheless, at the moment we are very lucky, also with the GT3 RS. S: A car like the GT4 communicates certain messages to the consumer, to the enthusiasts, the car world. And in response to that, the community sends messages back to Porsche. What message have you received with regards to the GT4? What is the customer saying to you? M: Only positive messages. They say always that these are the typical Porsches, which have all the features they expect from a Porsche. That is proof that our engineers know a lot about our customers and their demands. So, it’s fine. S: You came to Porsche five years ago from Audi and Lamborghini. What have you learned in these five years at Porsche? What have been takeaways for you? M: I suppose the most two important things for our success are that we are a very slim company, which is able to take very fast decisions—very flexible—and the quality of the team. It’s extremely high at Porsche all over the world—also, for example, here in Atlanta. And those are the most important things to further success. We will foster that. S: What has surprised you in these five years about Porsche? M: I suppose it’s the culture. If you look, for example, to the LMP1 project, three years ago we had a white sheet of paper. And now we are fighting against Toyota and Audi in LMP1 for victory. And of course we are looking forward to Le Mans in four weeks to have a huge victory. S: And how does the culture of Porsche differ from Audi when you were there? M: We are a smaller company, and that is the one difference. Another is that Porsche has a very impressive history. And that is what we are dealing with today. This evening, we have as our guest Dr. Wolfgang Porsche, who is the [grandson] of our founder, and this is like—it’s like a family. S: What do you feel that Porsche gets right? What are three things that Porsche gets right, as general concepts? M: First of all that we have been able to develop strategy 2018. That is one thing. Another thing could be the LMP1 project, and the success we have with that for the enthusiasm we have in the company. And I suppose the economic success we have—we are the most successful manufacturer of sports cars all over the world. And that’s fine. S: So, are you any closer on a seventh model line? M: [Laughs] We are discussing that week by week and day by day. And at the end of the day we will have a decision. And I suppose we should have a decision soon. We have a lot of ideas, but as you know the parameters and circumstances for the future of the automotive industry are difficult. Will we have combustion engines, or plug-in hybrids, or even driven cars? So it’s not so easy to decide these things, but we’re on a good way. S: With the kind of success we’re seeing with Cayenne, Macan, Panamera, the four-door cars—what one might term high-volume cars—as you look at a seventh model, does it have to be a high-volume car, or can it also be a low-volume car? M: What is high-volume for Porsche? [laughs] I’m not sure. We should be able to have a good business case with low volume compared to other volume manufactures. S: Do you feel the current Boxster and Cayman, the current 981, is a good business case? Has this car sold well? S: It surprises me constantly in sales numbers, because the 981—to drive—is so fantastic. But the sales numbers to me are quite low given the value of the vehicle and the excellence of it. M: Okay. That may be, but the reason is in China. We have to do a lot of homework in marketing to make them familiar with these two-door sports cars, mid-engine, and so on. They do not know the history. And what we can do, for example, is to build a driving experience center in Shanghai to give them all of the opportunity to drive fast. And so we need a little bit of patience for that. S: Many of the prestige buyers there don’t want to drive, they want to be driven. Is that fair? M: No, it’s changing a little bit. S: You worked with Ferdinand Piëch for some time. What are your thoughts on him as an engineer—not just at Volkswagen, but also for automobiles. M: Yes, he has worked with a huge success for Audi, for Volkswagen, for Porsche—so he’s one of the greatest automotive engineers I have ever met. S: You began not as an executive, but as a toolmaker. Can you tell us a little bit more about that? You apprenticed as a toolmaker. What were you actually doing? M: [Laughs] Before I studied information technology, I was a toolmaker, yes, and I was in the tool-making area of Audi for two or three years I suppose. It was interesting. I learned a lot. And of course what was the most important thing for me [when I worked] on the shop floor was the guys who are doing some tools and other things for the cars. That also [shaped] my opinion of how important are the engineers and the toolmakers and everybody in such a factory.